Combine all ingredients, adjusting the amount of curry powder and also the mayonnaise to your liking. Stuff Cream Puffs with the chicken salad. Chill, and serve proudly. Don't have time to make Cream Puffs, simply spread the chicken salad on white or whole wheat bread and cut into triangles before serving. Looking for a tea time treat? Here's a fun little lemony cake that uses a small amount of leftover lemon curd. Prepare miniature yellow cupcakes. Scoop out a small portion from the center of the cupcake, and fill the center with lemon curd. Top with freshly sweetened whipped cream, and sprinkle the top with the cake crumbs. Yum! Lost your microwave lemon curd recipe? We posted a tutorial on lemon curd making on our March 9, 2009 post. One of my favorite ways to dry herbs is in the fridge. In order for this to work it must be a frost free fridge but it is a great way to dry herbs locking in the color and the flavor. To dry, simply take a small hand full of your herbs. 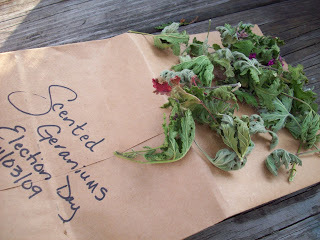 This time I dried the final harvest of our fragrant scented geraniums. 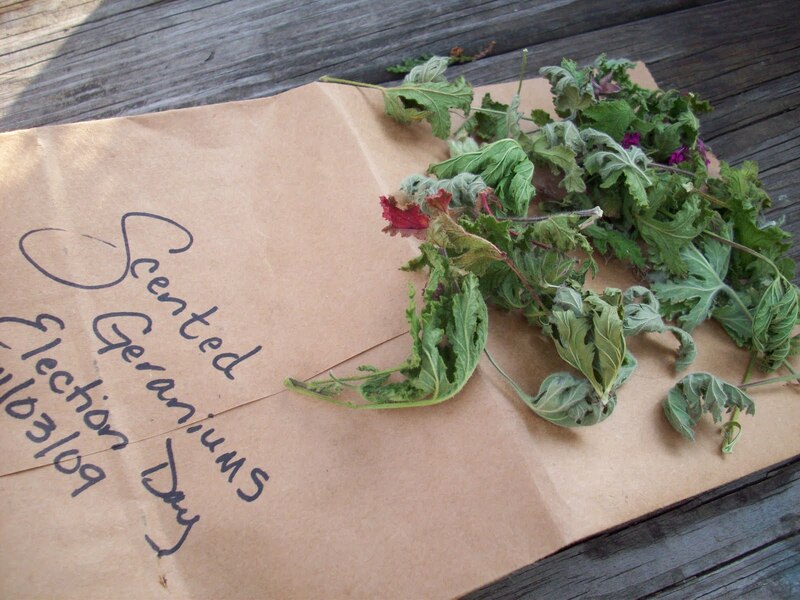 Take about 15 t0 18 stems and put them in a brown paper lunch bag. It is always a good idea to label/date your bag. Fold down the top of the bag and place in the refrigerator. It takes about two weeks (hard woody stem plants like Rosemary take longer) but essentially the herbs are dehydrated. Once they are completely dry you can take them out of the bag and bottle the herbs, and enjoy using your summer herbs all winter long. Please Note: Although we're posting this in the dead of winter for the Northeast, it is our fervent hope that someone somewhere is able to harvest their garden and is so inspired by this post that they are harvesting right now. For those of us still buried under inches, nay feet, of snow, please save this information for the appropriate time. It is invaluable. The post was originally written in November and didn't get posted at that time, and before you know it, it was winter and the holiday season. The main reason it is being posted now is that the author of this post has threatened to never blog again if it doesn't get posted, plaintively asking 'what's wrong with my blog post?'. There's nothing wrong with this blog post, it's a wonderful blog post, excellent information, great photos, just not quite appropriate at this time. But, I want this monkey off my back, and I want my blog partner to continue posting too! How about you? Old recipes... collections of tried and true recipes, or not... written by hand, clipped from the newspaper, scribbled on any piece of scrap paper and saved, or acquired from family and friends.. This is only one of our Mother's recipe notebooks, stashed away in a closet, only to be discovered again. Notice the date, and her comment on this orange cake recipe...Delicious! 1974... orange cake happens to be the Old Boys favorite, so several orange cake recipes have been saved. And to this day, notes and comments appear on recipes that have been made. This last recipe (orange cake, again) has a newspaper clipping attached to it that announces a family dinner that was held at our Father's brother's home. It is noted that they served rabbit and pheasant! It also lists the family members present, and reading the guest list, Marj, Nancy, and Susanna were not present, dating this clipping to sometime between 1948 and 1950, when dinner parties were indeed newsworthy. Today is the day before Ash Wednesday, the start of Lent, and many parts of the world have different traditions such as Mardi Gras or Carnival. Here in our part of Pennsylvania, Shrove Tuesday is known as Fasnacht Day. A Penna German tradition, Fasnachts are basically a doughnut without a hole. Traditionally made with potatoes and yeast, they can be served plain or coated with sugar or powdered sugar. Many churches will make these as an annual fundraiser. Our grocery store also makes them all day long trying to keep up with the demand. They are so popular you could smell the Fasnachts before you even entered the store. There are many spellings of Fasnacht, Faschnacht, Fausnaughts, but it doesn't matter how you spell it, it will still "eat good" giving this Tuesday its other nickname of Fat Tuesday! Wishing you a very special Happy Valentine's Day! Hope your day is truly enjoyable! Cream butter and sugar in a small mixing bowl. Add vanilla. Combine the flour and cocoa; gradually add to creamed mixture. On a lightly floured surface, roll out dough to 1/4 inch thickness. Cut with heart shaped cookie cutter. Place on ungreased baking sheets. Bake at 375 degrees for 8 - 10 minutes, or until cookie is firm. Cook on wire racks. Melt white chocolate (either with your microwave or on the stove top with a double boiler). When melted, mix in shortening. Dip half of the cookie in the chocolate, place on wax paper lined tray. Put remaining chocolate in a parchment triangle and drizzle over top of the cookies. Chill cookies until chocolate is firm. Store in an airtight container. Yield: 2 - 3 dozen cookies, depending upon the size of the cookie cutter. Present cookies to your true love with a warm embrace! Combine cream cheese and confectioner's sugar in medium mixing bowl. On medium speed, beat until creamy. Add almonds, cherries, and extract. Combine well. Using a teaspoon, scoop 12 truffles onto parchment lined tray. Chill until firm enough to handle. When firm, roll each truffle into a smooth ball. Chill again. Melt chocolate chips (either by microwave or with a double boiler on the stove top). Add shortening to melted chocolate, mixing well. Dip truffles into chocolate, sprinkle almonds on top before chocolate hardens. Keep refrigerated. Present to your Valentine with a smile and a kiss. if we click our heels together three times while repeating that certain phrase? Winter came down to our home one night, quietly pirouetting in on silvery toed slippers of snow, and we, we were children once again. ~Bill Morgan, Jr.
Another suggestion for Valentine's Day is our Love 'Tea', actually a tisane since it's all herbal ingredients. It contains herbs that have aphrodisiac properties such as damiana, muria puama, white oak bark and others. There's also rosemary for remembrance and roses for love. It is suggested you sip this herb tea slowly while listening to your favorite love song! Although it does have a medicinal taste to it, the end result is what you desire, right? This truly delicious caffeine-free blend of aromatic herbs and spices produces a ruby red color in the cup. It is full bodied, with a combination of just the right amount of natural sweetness (thanks to the licorice) and a lovely tart flavor. You'll find wild cherry, rose hips, orange peel, hibiscus, spearmint, and more in this lovely herbal tisane. Perfect hot, lovely iced, it also makes a delightful party punch. Simply brew the tea, chill, and add ginger ale for a non-alcoholic spritzer. Your Valentine will be pleased. 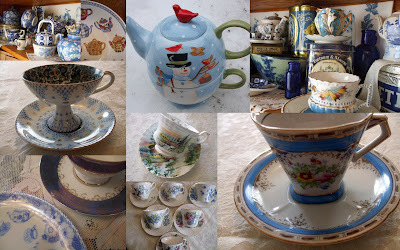 Available at The Rosemary House, of course, (in the shop, or by mail-order), and served proudly in the tea room. Something tells me we're not in Hawaii any more. This is the view out my kitchen window, with predictions for an additional 10 inches before it's over... here's the same view on a 'typical' day. Ecological Graffiti! Ya gotta love it! No billboards along the highway but instead people have left their mark with coral found on nearby beaches. 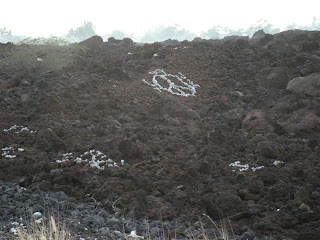 The white coral positioned on the dark lava made for some interesting reading. We would learn that Sara was an '09 grad. Or Trish Heart Dave or even that Bob and Joyce celebrated 25 years. Words of peace, love, aloha to the left and right. This is the Autograph Tree (Clusia rosea). A West Indian tree that can withstand high winds and salt spray. You can etch your autograph on the large leaf of the tree and it will continue to grow. This plant shouldn't be confused with the Sea Grape (Coccolobis uvifera) which grows in tropical/sub tropical climates and is used as writing paper. Angelica at work. Leaving her mark on HI. Hidden on the rainy slope of Mauna Kea on the Big Island is a family owned and operated tea garden, Mauna Kea Tea. Beautiful lush rows upon rows of Camellia sinensis are being organically grown and lovingly tended by Takahiro and Kimberly Ino. They are determined to utilize environmentally responsible growing methods that include building a healthy soil life and micro cosmos on the farm which promote healthy plants and reduces the occurrence of pest problems with the ultimate goal of producing tea that not only tastes good but also heals the earth and their spirit. According to Takahiro, "it has to be a comforting and healing place to be. It does not only produce tea. I work with the plants and the land to create an amazing space and time. Other people in the field also have to have positive energy." Following our tour of the Tea Garden, we enjoyed a Tea Tasting provided by Takahiro, a certified Japanese Tea Instructor. 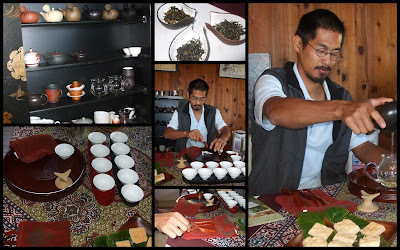 His wife, Kimberly, is certified by STI, the Specialty Tea Institute of America (Level 1 and 2). We sat around the table and watched as Takahiro expertly and proudly prepared his locally grown organic Hawaiian green tea. First we sampled a Green Tea and then two separate steepings of their Premium Green Tea. The Green tea is produced by carefully hand plucking the young shoots of the tea plants. The harvested leaves are hand processed in small batches, gently drying the tea leaves with a repeated rolling process until the leaves are gently twisted and curled. The tea liquor is light yellow to pale golden. The flavor was pleasant, a delicate green. The Oolong tea, prepared in a gaiwan, produces a golden to amber liquor with full body and a very fruity aroma. The floral taste of the Oolong was quite predominant. Little squares of shortbread accompanied the tea tasting. Mahalo to Kimberly and Takahiro for providing this enjoyable morning visit at their Tea Garden, sharing their love of the land and the leaf. It was a truly memorable experience. The Amy B.H. Greenwell Ethnobotanical Garden is a 15 acre garden featuring 200 species of plants and their uses. These were all plants that grew on traditional farms and native forests prior to Captain Cook's arrival. Endemic - found no where else in the world. A remarkable 90% of HI plant material originally fell in this category. Polynesian Introduced - Brought by Polynesian settlers as necessities to their culture either for food, medicine, ceremony, etc. The Hawaii Tropical Botanical Gardens, a tropical rain forest nature preserve, features over 2,000 species of tropicals from bromileads, palms, heliconias, orchids , and many more gingers then I was aware of. It is a garden located on quiet fertile soil, nestled in a valley and overlooking the ocean. Waterfalls and streams wind throughout the forest and palm jungle. The 40 acres were developed by a husband and wife duo. They began the work in 1977, carving paths by hand through the valley, careful not to disturb the natural beauty. The garden was finally opened 17 years later as a non profit. We consider this garden one of the treasures of the Big Island. Pure beauty everywhere you looked. 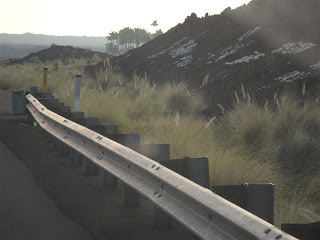 It's a 'must see' when you visit the Big Island. ...the coconut guy. While at the black sand sea turtle beach, we encountered a local, who for a nominal tip would crack open a fresh coconut so we could drink the water (we learned that old coconuts have the milk) and then sample some of the coconut meat. He was very quick and skillful as he opened the coconut shell with his steel knife, quickly carving out the coconut meat. A multi-talented vendor, he was also weaving palm frond baskets and hats as well. This photo of Cedar and Larry the coconut guy just totally cracks me up. Hang Loose. David and I enjoyed our time with Hawaiian Herbalist Kai Kaholokai from the Kai Malino Wellness Center. Kai was very informative in explaining that the Hawaiians consider their traditional medicinal plants (La'au Lapa'au) sacred because of their usage by the ancestors and gods as were told in their ancient chants (mele). Angelica is subject to a minor asthma condition and I was concerned about the VOG affecting her. So I purchased Kai's 'Uhaloa-'Awa-Popolo Elixir for asthma, coughs, colds or flu symptoms. Fortunately, this blend was also labeled with Latin names! Waltheria indica, Piper ethysticum and Solanium nigrum respectively. Later, when Angelica did develop a cough from the VOG (Vog is volcanic gases, mostly sulfur mixed with oxygen and moisture. Think smog only vog), David went out and purchased Uncle Kimo's Herbal VOG Tea. This tea is developed from old traditions to cleanse the body from VOG symptoms. These ingredients were: 100% Hawaiian Mamaki, Ko'oko'olau, Liko Lehua, Lau-Kahi, Ha'uoi, and 'Awa. No Latin names, no English names. I was lost! The only one I recognized was 'Awa (kava kava). Well we put our faith in the Hawaiian ancestors and brewed up pot after pot of herb tea. Angelica took it faithfully and to no ones surprise it helped! Even later in the trip, I purchased a book from the Amy Greenwell Ethnobotanical Garden called Native Hawaiian Plants and couldn't wait to look up these names to see what I had been giving to my daughter! I was happy to learn the herbs were ones I was familiar with: relatives of Nettles, Hibiscus, Vervain and common plantain.